I know it's a hard time for a lot of people out there, so let's keep this light. I was made aware of a new Kickstarter campaign by Andrew Rader, an MIT Phd and Space X engineer. 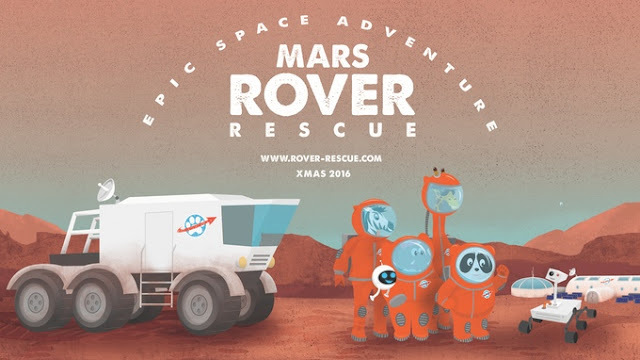 It's a children's book called Mars Rover Rescue and it is aimed to present space science in a way that is approachable and easy for kids to understand. It is a really interesting project that I think you should support, especially if you have or know any children who are interested in space. We are big fans of space here at Somnambulant Gamer. We play Kerbal Space Program regularly, as well as tinker with Universe Sandbox, Space Engine and Outerra. When I became aware of this project, I immediately wanted to share it with you all. Mars Rover Rescue is the second book ing the "Epic Space Adventure" series and features a number of animals as astronauts on a mission to find and recover a lost Mars rover. It is a 56 page book filled with great illustrations by Galen Frazer. One of my favorite things about the book is that it was written by someone who is an active part of the field. It is one thing to find a fun book for your kids that has accurate facts, but it's quite another to have that same book infused with the enthusiasm only someone working in their element can exude. Please go take a look at this project. Mars Rover Rescue is currently sitting at about 85% funding. They are only asking for $10,000 to help get the book off the ground. The book itself has already been completed. The pledge rewards have some really great rewards including a school donation option and extra things like stickers, a coloring book and a memory card game based on the book. Check it out!